Beautiful marble and natural stone counters, vanities, and flooring require proper maintenance to preserve their spectacular beauty. How long has it been since you installed your marble? Is it looking a little dull on the surface, and after a closer look do you see marks or discoloration on the surface in natural light? Scratches can accumulate over time, causing the marble to adopt a flat, dull appearance that doesn’t reflect light anymore. The temptation may be great to attempt to bring back it’s former beauty yourself. However, Keith Clay Floors recommends professional polishing and honing so you do not permanently damage the surface of the stone. To avoid potential damage, we will evaluate your marble and let you know what we recommend. Each floor, countertop and vanity or tub is different, and it usually depends on location, it’s use, and normal wear and tear. Keith Clay Floors understands that most of you are eager to have those household DIY projects completed. We also understand that due to the precise nature of the polishing process, (i.e. marble polishing, stone polishing, and marble and stone honing), DIY marble maintenance is not something we recommend that you attempt. Marble care on this level is a complicated process that is not easy to perform. Proper education and an understanding in the actual details of the process are required to make that final, clean, light reflective surface you desire to re-appear. Really it isn’t easy either. Polishing the marble is a very important step in the marble restoration process, but it is not the only thing that needs to be done. A word to the wise, simply polishing your stone or marble without undergoing the honing process, absolutely will not remove unwanted etch marks or accumulation of scratches. Honing is a complex process necessary when restoring your marble floor or other surfaces. It is undertaken with the use of diamond encrusted pads to scratch, or hone, the marble surface. It is this surface creation which will actually be the foundation for the polishing process. Honing marble first starts with a coarse grit, diamond pad and continues with finer grits to attain the desired level of polished finishes. This process requires the right skills, the knowledge of the type of marble you are working with, and the proper chemicals and equipment. You’ve heard the old saying ‘the right tool for the right job’; this is critical in polishing marble. Keith has the tools to provide mobile, in-home, marble honing and polishing. Polishing Marble enables the actual surface of this magnificent stone to show it’s reflective properties again like nothing ever happened. The final step begins by polishing the marble with polishing powders. More commonly known as a chemical polish, this stage in the process happens immediately after honing for the best results. While different types of marble seem like they would be hard enough to resist damage, most can become scratched or etched with marks over time and use. Coming in contact with other hard surfaces can cause scratches, and having acidic liquids that come in contact with a marble surface may also cause a reaction with the calcium in the marble which leaves discoloration and pitting. This is what etching does. If the etch mark is not too bad, sometimes polishing with a powder will fix the problem. However, if the etch mark becomes too severe, honing is necessary to remove the etch mark and then the surface is restored and then can be polished. A seasoned 30+ year professional like Keith Clay Floors who has a trained eye, can properly evaluate what is required to restore the beautiful luster once associated with your floor. Do You Have To Polish Marble Floors? If you have marble floors in your home or place of business, eventually they will need to be polished. It’s a given. It is also true that if the installation of those marble floors, countertops, or vanities is a few years old, it is very likely they will need to be honed first. That said, it is also true that depending on the evaluation of your surfaces, Keith Clay Floors may be able to do just a polishing step to restore the brilliant finish, but after 30+ years of experience, unfortunately this is the exception and not the norm. Sometimes we are called to look at a marble floor that has been etched by an acidic cleaning chemical. It is possible that if the etching that has occurred to the surface is not too bad, we may be successful in bringing back the brilliant finish. 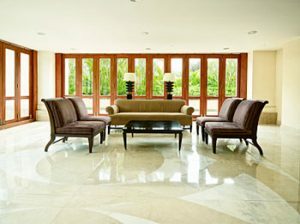 When it comes to marble polishing or just maintaining natural stone, tile, and grout products in your home or business, at Keith Clay Floors we strive to help educate our customers on the best protection they can have, helping them save time and money in costly restoration costs down the road. If you are a current customer, you understand this is true with every aspect of our business and something that keeps you coming back for all your flooring needs. Keith Clay has been in business for 30 years serving Dallas, Frisco, Plano, Richardson and all Dallas Metroplex suburbs.